Joining in with the celebrations to mark Libraries Week, the Carnegie UK Trust and Wellcome have announced the fourteen projects which will be funded as part of our innovative Engaging Libraries programme. Engaging Libraries is a pilot, supported by £200k of funding from Wellcome, which encourages public libraries to engage local people in imaginative and interactive projects exploring health and wellbeing topics. In fact, the quality of applications was so high, that Wellcome committed an additional £85,000 to fund not 8-10 projects as originally planned, but 14 projects from across England, Scotland and Wales. 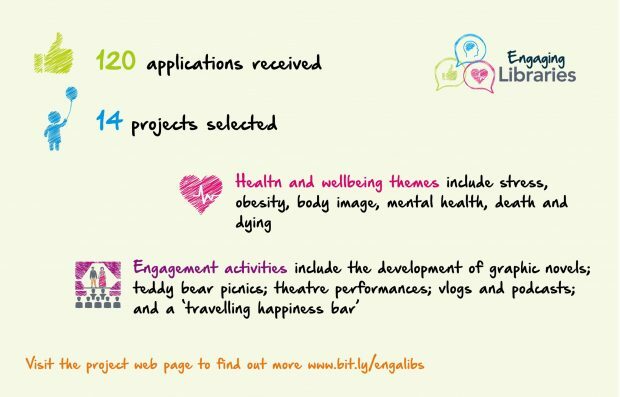 We encouraged applicants to be creative and offered them the opportunity to take risks and opportunity to move beyond health promotion and explore new dynamic and discursive ways in which to connect people with health and wellbeing topics. A key ask of the programme was for libraries to work in collaboration with partners from outside the sector, which has led to an exciting array of partnerships – from artists and academics to youth groups and residential homes. The projects funded will enable members of the public to discuss, debate and engage with major health issues including stress, obesity and body image, in both serious and playful ways. From Somerset to Lancashire, there will be a range of activities including teddy bear picnics; theatre performances; the development of graphic novels; vlogs and podcasts; and a ‘travelling happiness bar’ visiting local communities and delivering a series of pop up events. Here is just a flavour of what the 11 successful projects in libraries across England will offer. Working with partners including Mental Fight Club, the City of London libraries will spark discussion on mental health through creating a mental wellbeing sanctuary featuring talks, film screenings and performance workshops, specifically targeted at males working in the City. Working with partners including arts and education filmmaking charity Signals, the successful “No Filter” project aims to encourage children and young people to discuss stress, relaxation and mood, using vlogs, blogs and podcasts about their everyday lives, how they manage stress and how they improve their wellbeing as a starting point for conversations. Redbridge Libraries will use their position as a safe and trusted space in the community to spark conversation and discussion about end of life at facilitated ‘Death cafés ’ and a one day festival inspired by the Mexican Day of the Dead; removing fear and barriers and normalising discussions about death and dying. In an innovative collaboration between four library services, Essex Libraries, St Helens Libraries, Libraries Unlimited (Devon) and Sheffield Libraries will develop projects to explore the concept of empathy and its relationship to wellbeing through public engagement activities and supporting emotional skills, culminating in interactive library activities on Empathy Day in June 2018. Engaging Libraries participants will be coming together very soon for a Kickstarter Day, to meet each other and share their hopes for their projects and ideas around public engagement. We’re excited to see how these projects progress!